Although VRLA batteries have dominated the Industrial Battery Market since they became commercially available in the mid 1980’s the lead-acid Planté battery still has an important part to play. It has been argued that the Planté battery is the most reliable emergency power supply available. Whether this is true or not is a matter of opinion. What is true, is that there are many Planté batteries still in service that were installed over 20 years ago and some are still in reliable operation over 30 years of age. Planté batteries are still manufactured by a small number of companies and remain popular in many industries where reliability is paramount. Because the voltage of VRLA batteries is not as stable as Planté batteries and specific gravity measurements cannot be taken, instruments that measure the ohmic resistance of batteries has gained popularity in trying to determine their condition. Ohmic measuring instruments were first introduced for use on VRLA monoblocs of 6V and 12V up to about 400Ah and not for 2V 1000Ah Planté batteries where the accuracy is debatable. The accuracy of these instruments remains the subject of much discussion even for VRLA batteries. In some respects it is unfortunate that these ohmic measuring instruments are sometimes used to determine the state of health of Planté batteries because they were not designed to work on large capacity cells. There is little doubt that some readers of this article will disagree arguing that they have an instrument that will work on any battery including vented NiCd. This argument is not the subject of this article but is intended to give a more practical understanding of measurements that can be readily taken with a high degree of reliability on Planté cells. Specific gravity values published by manufacturers are not definitive and are difficult to relate to actual in service values. This is because a lead-acid cells an electro-chemical device, which is subject to manufacturing process variability and consequently the final product also has some variability. Additionally, the specific gravity does not change instantly with state of charge and therefore the values obtained need to be carefully analyzed to ensure they are meaningful. Lead-acid batteries do not follow conventional electrical principals, nor do they follow conventional chemical reactions and as such they need to be considered as a variable product. In conclusion, while float voltage, ohmic measurements and specific gravity values are not finite; we can use these values to good effect in establishing if a battery is in good condition or needs remedial action. This article considers records that have been, or will be taken on batteries that have been on float charge for some time, i.e. as they will have been in normal service. A) Chargers vary in design and age and ability to control the voltage at different loads. The voltage may be very stable if there is no standing load but at a high load the variability may be considerable which will affect the stability of the cell voltages. With variable loads, the cell variation is exacerbated. B) The operating temperature may vary and this will change the charge acceptance characteristics of the battery and the variability in float voltage will be affected. Variations in cell temperature across the battery can easily be 5°C and this will affect the individual cell float voltage. C) Charger ripple current will affect the cell voltages. 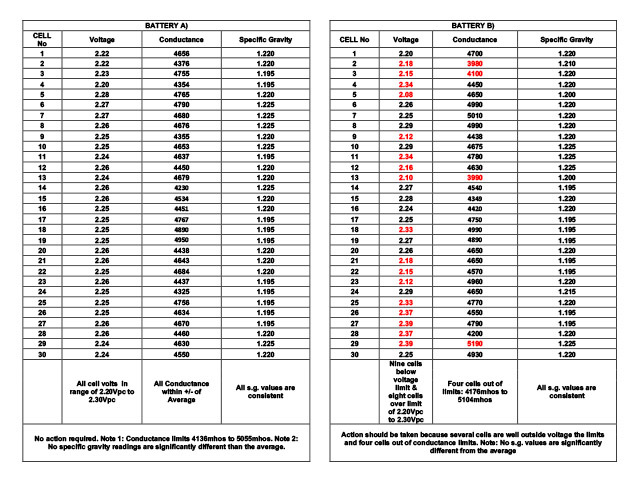 Looking at the practical values of float voltage, a variability of +/- 0.05Vpc is generally acceptable. For an average float voltage of 2.25Vpc this results in a maximum of 2.30Vpc and minimum of 2.20Vpc. Anything outside these limits must be considered suspicious but it does not indicate a failed cell. If a cell voltage is at any time lower than the average by more than 0.05Vpc, i.e. below 2.20Vpc in this example, it should be investigated. The greater the deviation is and the more serious the consequences will be if no action is taken. Any individual cell with a voltage below 2.15Vpc must be investigated without delay. Low voltages are more of a concern than high voltages and some relaxation of the maximum voltage may be tolerated up to an absolute maximum of +0.08Vpc above the average. In this example anything between 2.20Vpc and 2.33Vpc (+0.08Vpc to –0.05Vpc) may be considered acceptable but a note on the record file should be made highlighting any cells that are at or close to the limit. This way, the next time the service is carried out it can be immediately seen that some cells were on the limit. If any cells are at the limit, or above, it would be prudent to measure again after approximately 6 months to verify the first set of readings. If, at the second set of readings, the voltage is seen to move further out of the range +0.08Vpc to –0.05Vpc, investigations must be carried out to establish the cause. If the readings were within +0.08Vpc to –0.05Vpc after 6 months, it would be reasonable to revisit at the annual service, i.e. after a second 6 months. If the voltages continue to be within the limits, it would be reasonable to continue with normal service checks and no action need be taken. However, if the cell voltage variability has increased, it would be prudent to investigate without delay. Just because the voltage of any individual cell is outside the recommended limit does not mean that the cell needs replacing. In the first instance, investigations need to be made to establish why the voltage is outside the specification and if no good reason can be found and otherwise the cell appears to be healthy, a “boost charge” maybe considered. A cell will only need to be replaced after detailed evaluation. Planté batteries are very reliable and rarely fail without warning. However, it is important to keep records for comparison over the lifetime of the product. Below are examples for guidance that relate to the tabulated results further down the page. 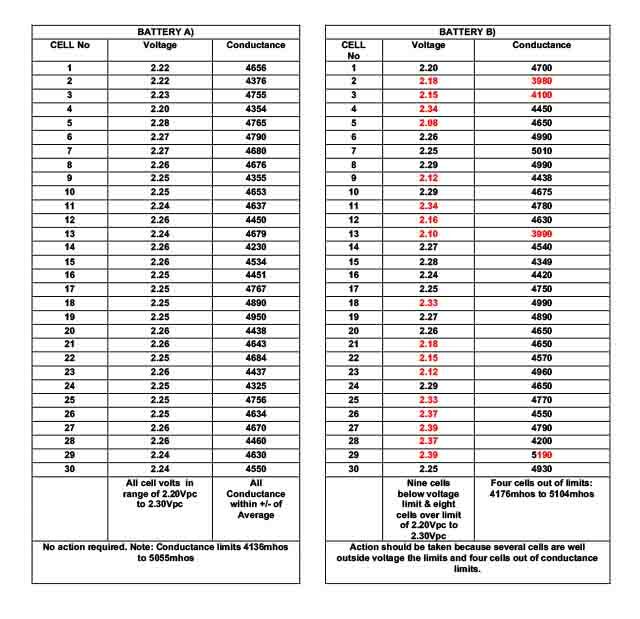 Tabulated results headed Battery A) All cells within voltage limits, no action. Tabulated results headed Battery B) Repeat the measurements and if confirmed, investigate further because several cells are well outside the voltage limits. 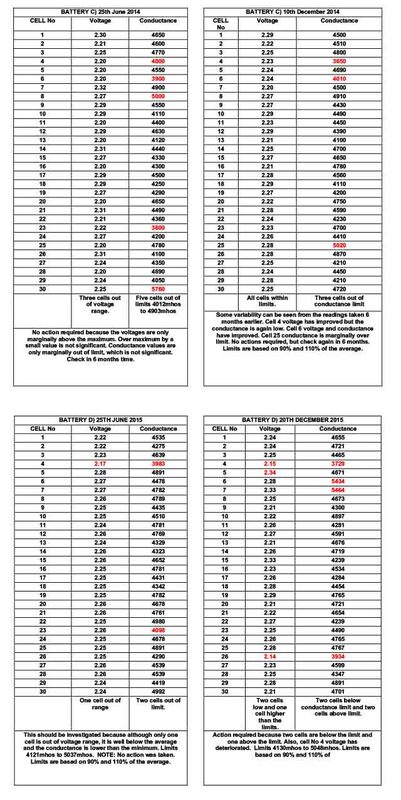 Tabulated results headed Battery C) On 25th June 2014 three cells high voltage and on 10th December 2014 (approx. 6 months later) all cells within voltage limits, no action required. Tabulated results headed Battery D) On 25th June 2015 one low voltage cell and on 20th December 2015 three cells out of voltage limit and one of the three has deteriorated. Investigate further. Internal resistance values that are published by manufacturers are generally produced from D.C. discharge tests carried out on one or two cells from the same “family” and the results are extrapolated to produce values for each individual cell type. These tests are usually carried out in accordance with BS 6290 Part 1 where two discharges are carried out, and the results extrapolated to obtain a nominal value. The results give a D.C. resistance value in ohms. Hand held or fixed battery monitors usually give results of impedance or conductance and not a D.C. resistance. Impedance and conductance results do not easily correlate with the D.C. resistance value published by the manufacturer. Variations between ohmic measuring instruments occur because of the different methods used by the different instruments used, including applied frequency and amplitude to obtain the value. The use of ohmic measuring instruments may be used to good effect for establishing the condition of Valve Regulated Lead-Acid (VRLA) cells where a visual inspection and specific gravity measurements cannot be made. The end of life of VRLA cells is generally due to positive grid corrosion and growth often accompanied with drying out. Planté cells have a different end of life failure mode that does not follow that of VRLA cells. Ohmic measurements may not be 100% reliable but can be used to compare different readings for cells in the same battery where an out of line and poor ohmic value may indicate a low performing cell. If a poor ohmic value is observed, even if the voltage is acceptable, investigations should be carried out to establish why. In the first instance, the measurements should be repeated to verify the results. If they are confirmed and all other parameters including float voltage and a visual inspection show no abnormalities further investigations should be made. A possible problem could be a high resistance inter-cell connection joint, which may not show up with float voltage measurements. It may also mean that the cell is in a poor state of health and needs to be replaced. When considering % deviation from the base value, we need to consider where this base value came from. Remembering that the product is an electro-chemical device and subject to variability, we can expect this to be different not only from cell to cell but also from manufactured batch to batch. It is not unusual for the ohmic value to deviate by +/-7% from batch to batch. With this in mind a +/- deviation of 90% to 107% can be expected under ideal conditions. Many users of VRLA cells would consider a low conductance as 80% from the base number to be acceptable. Some consider 60% as the “danger point” for replacing cells. However, if one cell is showing a 20% deviation from the group average, this is sufficient to consider further investigations. Also, it should be understood that the actual method used to obtain a % from the base value necessitates that each reading is measured in exactly the same way with the probe attached to the same part of the cell pillar for all readings. For example, on the terminal pillar including the inter-cell connector. With this in mind, the 20% deviation, from the mean value is a reasonable starting point to consider further evaluation of the cell. As in the case of voltage measurements, it is best to “trend” the results rather than consider a “snap shot” as a definitive answer to the battery condition. With VRLA cells the performance of the product deteriorates with time (age) and the product is normally replaced when this has fallen to 80% of the nominal. However, Planté cell performance is stable over a very long period and these cells are considered at the end of life if the performance is anything less than 100%. Ohmic measuring instruments cannot determine the difference between 99% and 100%; but neither can float voltage or specific gravity measurements. As with out of line float voltage, a “boost charge” may resolve the problem. The following examples may be used as guidance. Measurements of the cell specific gravity (s.g.) may be made with several different instruments but the most popular methods are by glass float hydrometer, or digital hydrometer. Glass float hydrometers are inexpensive but the results are open to interpretation by the operator and the results need to be temperature corrected, written into a log sheet for future evaluation and the instrument is easily broken. Digital hydrometers are more accurate and not, in the main part, influenced by the operator error and they are more robust. Some instruments have the ability to store the record value, which can then be down loaded for future evaluation, and the results are usually temperature compensated automatically. A) Temperature variation. Providing the electrolyte temperature is within +/-10°C of the standard temperature, no adjustment to the reading is normally required; the results will be sufficiently accurate. This only applies to actual field results where an approximation is acceptable and not laboratory evaluation. If there is a need to temperature compensate the results, the correction formula is: - ((Reference temperature – Actual temperature) x 0.0007) + reference s.g.
i) The fully charges s.g. of the cell being evaluated. ii) The fully discharged s.g. of the cell being evaluated. iii) The fully charged s.g. at maximum electrolyte level of the cell being evaluated. iv) The fully discharged s.g. at minimum level of the cell being evaluated. We need the above to calculate the state of charge at any electrolyte level. In practical terms, the only time that s.g. measurements are truly meaningful is to establish the fully charged condition with the electrolyte at the maximum level such as during commission charging. Even then, it is more appropriate to consider the s.g. change over time rather than an absolute value. During the commissioning charge the s.g. will rise steadily until it is fully charged when the s.g. will remain at a constant value. Although out of the scope of this article, it is worth noting that many batteries are incorrectly commission charged and the following give a typical reason for this. To complete a full and true commissioning charge, the Planté battery must be charged at a constant current of between 7% C10A to 10% C10A until the specific gravity plateau is reached. The voltage during the commissioning charge must not be limited and in practical terms, it will rise to a value in the order of 2.80Vpc. Frequently, a lower charging voltage is used and when the charger voltage limit is reached the current will fall away rapidly. When using a voltage of about 2.45Vpc to 2.55Vpc the battery will only be approximately 90% charged when this voltage limit is reached. The current will fall away rapidly and from this point, the state of charge will rise very slowly. Because the s.g. follows the state of charge, this will only rise very slowly and the cell may be interpreted as being fully charged when in fact it is not. Some Planté battery manufacturers state that the battery can be commission charged wising a modified constant potential where the maximum voltage is in the region of 2.40Vpc to 2.50Vpc. While this is possible, it will take longer to complete the charge. This will be in the order of several days not a few hours that can be acceptable using constant current. Additionally, it is generally accepted that even after several days at 2.40Vpc to 2.50Vpc the battery will not be truly 100% charged. 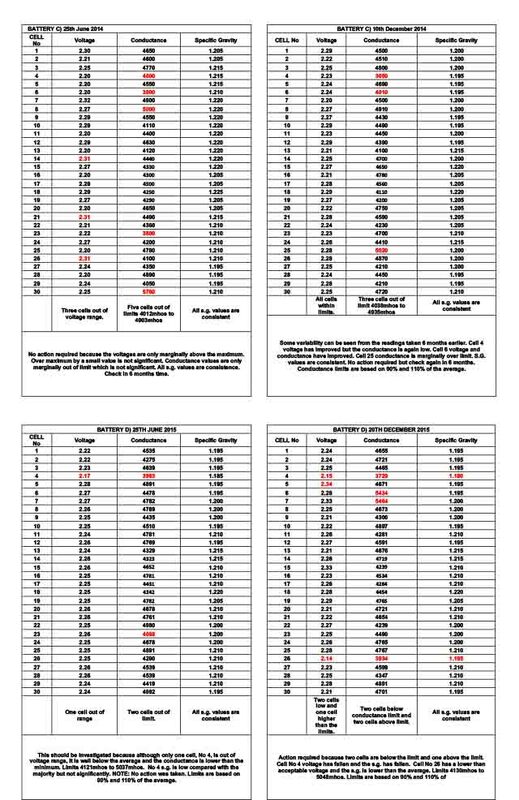 In practical terms this is not significant because all currently available Planté batteries are under stated. It is not unusual for a Planté battery to exceed 4h when tested at the 3h rate. It follows that even if the battery is only 90% charged, it is likely to pass any on site discharge capacity test. For guidance on commission charging at these lower “constant voltage” levels, always consult the battery manufacturer. Below are examples of the specific gravity measured for the batteries in the examples used above for voltage and ohmic values. Battery A) readings are all within a good range. Battery B) readings show that although 9 cells are below the voltage limit, and 3 cells below the conductance limit, no cells are lower than the typical expected specific gravity. This could be for several reasons. One reason may be due to the battery being recently part discharged. This can disrupt the float voltage and ohmic value but because the true state of charge has not changed substantially, the s.g. value has not reduced. The correct procedure is to investigate. BATTERY C) 25th June 2014 records, show that no s.g. values are outside that expected. Three cells have high float voltages but as discussed above, this is not significant without further information. The ohmic conductance of cell No 23 is lower than expected but the voltage is acceptable and the s.g. is within expectations. It is reasonable to take no action but to check in 6 months time. BATTERY C) 10th December 2014 records show some variation from 6 months earlier. However, the voltages and s.g. values are acceptable and it is only the ohmic conductance value of cell No 4 & No 6 that are marginally out of the expected limit. We know that ohmic conductance values can be misleading and because the volts and s.g. are acceptable, it is reasonable to take no action other than to ensure the battery is checked after a further 6 months. BATTERY D) 25TH JUNE 2015 records show that although the s.g. of cell No is acceptable, it is lower than the typical. Together with the low float voltage and low ohmic conductance is sufficient to warrant further investigations. NOTE: no action was taken after this service visit. BATTERY D) 20TH JUNE 2015 records show further voltage, conductance and s.g. deterioration of cell No 15. Cell No 26 also has low values of voltage, ohmic conductance and s.g. and further investigations need to be carried out to establish the reason. Float voltage, ohmic measurements and specific gravity readings can all assist in establishing if a Planté cell is in good condition or not, particularly if trending is used. In addition, a visual inspection of the cell will further help to confirm the state of health. We must not forget that we have the opportunity to look inside Planté cells. Very often, the appearance can give more information than any instrument readings. However, if the person looking at the cell has little or no knowledge of what to look for then we have to rely on instrument reading. Instrument readings alone must not be taken in isolation; it is better to trend the results. The use of instrument readings only will give us a reasonable assessment and confidence level but it will not be definitive. If the product is in question, some form of additional checks must be made and it may be appropriate to charge the complete battery at an elevated voltage or use a single cell charger to charge any cells that are suspect. Ultimately, it may be decided to replace the product. 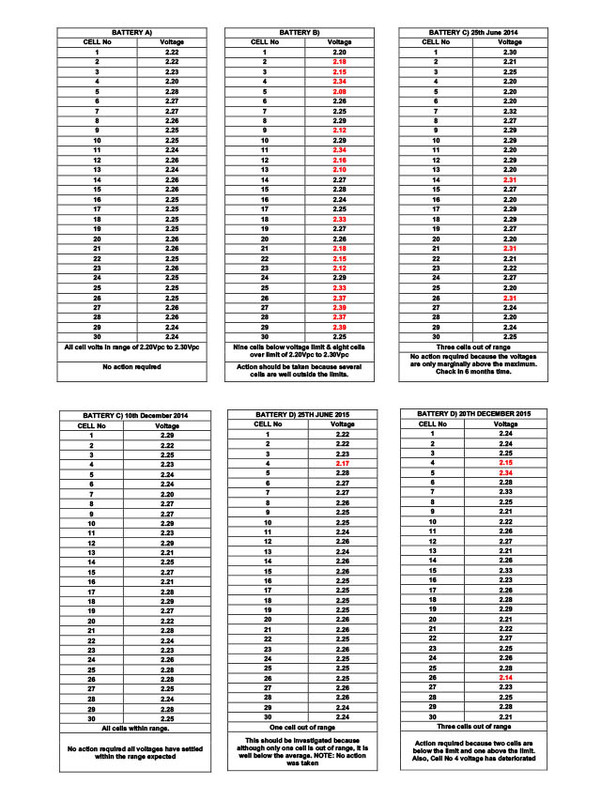 Float voltage measurements are the most accurate to use in detecting a low performance cell. In general terms, the float voltage will fall before a low ohmic value occurs and before a low s.g. is seen. However, a low voltage does not always confirm a low performing cell. Trending of voltages is the most accurate way to confirm the battery is in good condition. A cell float voltage more than +/- 0.10V from the average must be investigated without delay. An ohmic variation of more than +/- 10% deviation from skewed the average, i.e. 90% to 110% should be considered for investigation. This average should exclude any cells that are outside the mathematical average by +/- 20%. Any cell having a value that is in the negative direction by more than 20% of the skewed average should be looked at more closely. By adopting this principal, exceptionally low or high cell readings are excluded from the average. For example, if the mathematical average is 1550mohs then the limit is 1395mohs to 1705mohs. If we have 5 cells below 1395mohs and 2 cells over 1705mohs these should be excluded from the mathematical average and a skewed average calculated made which may be lower than the true average. For example, the skewed average may be 1750mhos and any cells below 1575mohs should be investigated. As with voltage, trending of the results is the best way to determine the condition. Manufacturers information must never be used as a pass / fail measure and should only be used as a guide. Instruments are often sensitive to probe position and the same position must be used for each cell measured and for subsequent readings. Measurements of specific gravity can be misleading because of temperature differences, electrolyte level and cell-to-cell variability. They are good in confirming a bad cell but not cells which may be marginally low. They are also good for confirming a fully charged condition during commission charging. A value that is more than 0.030 s.g. lower than the average must be considered for further evaluation and in the first instance the float voltage should be measured and compared with other cells as described above in section 4) above. Comparing measurements with each other is the best way to determine if a cell is suspect. A falling float voltage is typical of something going wrong. An ohmic value going in the negative direction can also indicate an anomaly taking place. If an s.g. value is more than 0.030 below that expected, it should be investigated. Ultimately, additional investigations need to be carried out to establish the condition of any suspect cell. Although the only way to establish if a cell or battery is in good condition and fit for the intended purpose is to carry out an actual discharge test, by sensible and intelligent use of instruments, a good confidence level can be established. It is important not to blindly measure and record the results, instead think about what has been measured and if in doubt measure again to confirm the result.